Carr at UPI Desk in March 1984. Carr was being treated for cancer. 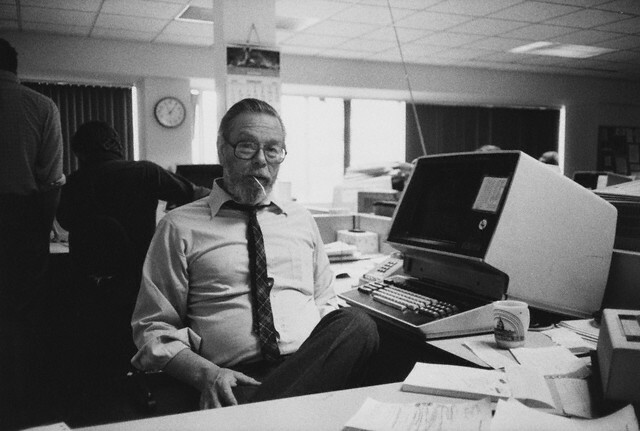 WASHINGTON, Dec. 28, 2005 (UPI) -- Lucien Carr, whose "poetic sense for truth" helped to spawn the Beat generation in the 1940s and then guided the news report of United Press International over four decades, has died at the age of 79. Intensely private, Carr was a close and influential friend of writers Jack Kerouac, Allen Ginsberg and William S. Burroughs -- the core of the anti-authoritarian, free-spirited Beat Generation -- who never sought to make a name for himself. He is best known publicly not for his writing, but for providing Kerouac with a roll of teletype paper that Kerouac used to write his breakthrough novel "On the Road" so he would not have to break his train of thought by changing sheets of typing paper. As a newsman, too, Carr much preferred the behind-the-scenes role of shaping news stories as an editor to the more high-profile job of reporting. But while unknown to readers, he was legendary among generations of journalists. Longtime UPI White House reporter Helen Thomas, who worked with Carr for many years, said: "I think he was one of the greatest editors UPI has ever known." "He was unflappable, he was a terrific writer, and he had an uncanny sense of being able to catch any error before it hit the wire," said Thomas, now a columnist with Hearst Newspapers in Washington. "He was a quiet man in the sense that he never bragged about his achievements or his contacts. All of his friends will really miss him. He was low-key, but you definitely felt his presence." Jon Frandsen, UPI Washington editor from 1985-90 who for a time shared a house with Carr in Washington, said Carr "really had an insistence" that Kerouac and Ginsberg be "sharp, short and to the point. He carried that same sort of thinking over to news. He felt news was the closest a human being could come to getting at the truth -- as a tool for people being able to change their lives. He brought that poetic sense of truth to the news business, in a way. He had a respect for the truth whether it was literal like news, or something more elusive and ethereal." Frandsen said Carr was proud of his association and influence with the Beat poets but was shy about it. "He was very proud of being part of this nucleus and influencing these guys," Frandsen said. "He didn't want all the attention that would come with it. He was quite shy about it. He loved hanging out with these guys. He was good friends with a lot of people." Kerouac biographer Dennis McNally said Carr had a large influence on the Beat poets. "When the so-called Beat scene, which was really four guys, started around Columbia around 1940-41, there was Allen, Kerouac, Burroughs and Lucien. Lucien was sort of the unacknowledged catalyst who became a brilliant editor at UPI. "It's very hard, even for me and I'm the biographer, to put in words the influence a person like Lucien had on Allen Ginsberg and Jack Kerouac, but they would not be who they were without Lucien," McNally said. "Lucien stimulated them intellectually in ways that were simply critical and that they both acknowledged." McNally said Carr's life particularly was changed by an incident in 1944: the stabbing death of David Kammerer, Carr's former Scoutmaster. "My understanding in contemporary language, David Kammerer would have been considered a stalker. He was gay. There was an incident, determined by the DA that Lucien was defending his honor, where he stabbed David and David died." Carr pleaded guilty to manslaughter and served two years in prison before being paroled. "He served his time, came out and joined UP. It affected the rest of his life," McNally said. He said Carr had talked about wanting to be a foreign correspondent, but decided instead to become an editor. "I think that was the difference between being a bylined reporter and being an editor," he said. Carr was hired by the United Press in 1946 as a copy boy, became night news editor in 1956, and went on to run the general news desk until retiring in 1993. A 2003 history of UPI, "Unipress," said "While White House Correspondent Helen Thomas was the widely recognized face of UPI in the second half of the century, Lucien 'Lou' Carr was, for many, the soul of the news service. The tall, slim graduate of the 'beat generation' rewrote, repaired, recast and revived more big stories on UPI's main newspaper circuit, the A-wire, than anyone before or after him." Carr was known for his gravely baritone voice that could be gentle and demanding at the same time. "Carr had few bylines during his 47-year career, but he was the undisputed champion of getting copy with other bylines onto the front pages of newspapers around the world," said "Unipress," the book by wire service veterans Billy Ferguson and Richard Harnett. "Carr had great instincts for news. More importantly, he could squeeze the most from other UPI reporters and editors with gentle, persuasive leadership in a high-pressure job often peopled by lesser talents with bigger egos and quicker tempers." UPI Executive Editor Tobin Beck said Carr "was a terrific editor, a towering figure in journalism who is sorely missed." Former UPI Managing Editor Ron Cohen called Carr "the absolute best newsman I ever knew." "He was very special to all of us. I don't know of anybody in the 25 years I worked with the company who was as universally beloved, admired and respected," Cohen said. Cohen said Carr "was the pulse of UPI, he was the brain of UPI, he was the heart and soul, he just affected thousands of lives in all the years he was sitting in the slot. He never aspired to be anything other than the guy who was the gatekeeper on the big stories. He was wonderful." David Wiessler, a Reuters senior Washington correspondent who worked at UPI from 1966-93, said Carr "had the best news judgment of any editor I've ever seen. He knew instinctively what was going to be on the front page of the newspaper the next day, which is vital for a wire editor." In retirement, Carr was an avid sailor, sailing his yawl on the Chesapeake Bay. "He sailed every weekend. He made a tradition of going out on New Year's Day," said Don Mullen, who worked with Carr from 1971 to 1983 at UPI in New York City. In an interview with Mullen a few years ago, Carr recalled starting at UP as a copy boy. "In October 1946, when I walked into the UP newsroom on the 12th floor of the Daily News Building it was rugless, provided with cuspidors -- for overnight shift fist fighters to trip over, I supposed, I never saw anyone spit in one -- filled with 60 smoking, blabbing guys, a few women and the rackety-rackety click-click bing-bing of a whole raft of teletype machines. "'See all these people?' asked Chief Operator Red Williams who hired me as a copy boy. 'They're all your boss. Learn their first names.'" Carr told Mullen that competition between the desks that produced copy for morning and afternoon newspapers was high, and editors sometimes tried to develop exclusive stories and rathole copy from each other. "The dayside element in UP tried to lord it over the nightside since it was older, and had more clients, including all those crappy Scripps-Howard PMers," Carr said. "Our retort was that we had all the good clients worthy of being called newspapers, starting with The New York Times." In October 1983 UPI's world headquarters and its National Desk moved to Washington and Carr went with it, spending the next 10 years there ramrodding the world and national news report before retiring in 1993. Asked a few years ago what was the best in all his years in the business, Carr told Mullen: "My favorite story both before and after computers was the Apollo 11 moon landing which seemed to me to be entirely above and beyond the usual coverage of that moiling mass of humanity that usually preoccupied us." Carr said political news never tempted him: "I never wanted to work on a story where the working verb was 'he said.'" Carr was born March 1, 1925, in St. Louis. In the 1940s and attended Columbia University in New York City, where he met Kerouac and Ginsberg and introduced them to Burroughs, whom he knew from St. Louis. Carr's survivors include long-time companion Kathleen Silvassy, a former UPI Washington editor; and three sons from a previous marriage: novelist Caleb of Cherry Plain, N.Y., Simon of New York City, Ethan of Amherst, Mass., and their families that include five grandchildren.